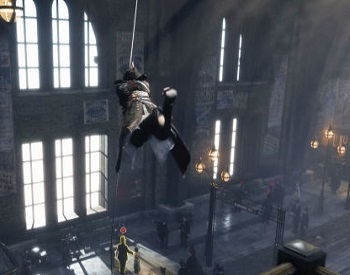 Assassin's Creed: Victory will be released for PS4, Xbox One and PC and take place in Victorian era London. The next Assassin's Creed will be named Victory and will take place in Victorian London. That, at least, is the indication of recent reports from Kotaku showcasing screen grabs from a leaked gameplay video and citing an anonymous source within in Ubisoft. According to said source, Assassin's Creed: Victory will release in the fall of 2015 for PC, PS4 and Xbox One. It will also be the only Assassin's Creed game coming out that year and will utilize the same Anvil engine used to build Assassin's Creed: Unity. Ubisoft, responding to the leak, has confirmed that Victory is being developed by Ubisoft Quebec. "The team in our Quebec studio has been hard at work on the particular game in question for the past few years, and we're excited to officially unveil what the studio has been working on at a later date," said the publisher. "In the meantime, our number one priority is enhancing the experience of Assassin's Creed: Unity for players." Ubisoft would additionally say that it's "disappointed" that Victory was leaked before it had a chance to formally announce it. The game itself will add more to the Assassin's Creed's formula than just a new location. The video viewed by Kotaku included sections where the player engaged in combat on top of moving vehicles (carriages and trains). The assassin in Victory will apparently also have a new grappling hook that sounds mildly similar to the one in Just Cause 2. All in all, it looks like an interesting new entry in the Assassin's Creed franchise. Then again, if Victory winds up having problems like Assassin's Creed: Unity, it could further sour player's opinions of the series. We'll just have to wait and see how well Ubisoft Quebec does with the game.